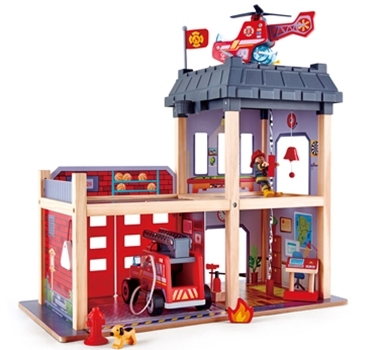 This tri-level wooden fire station is ready for any emergency, with furnished office, eating and sleeping quarters, a working garage door, and a fire pole that goes from top to bottom. Suitable for children 3 years and up. Made from natural wood and durable materials made to last generations and not be tossed out. Manufactured in a facility that strategically considers surface treatment, energy consumption, and packaging options to minimize environmental impact and maximize efficiency and that has introduced key processes to ensure that the variety of by-products produced cause minimal impact to the environment. A water purification system utilizes limited or no chemicals to release the cleansed water back into circulation.